Being a Beauty Blogger I am being asked many a times about the benefits of using Organic & Natural Beauty Products which includes Skin Care & Make Up both . People do ask me Why to buy such expensive organic skin care products , what’s wrong with the ones we are using since ages ? I have explained this to many about the ill effects of harmful chemicals in these products and why choosing a herbal or organic one is better in long run . Today in this post I will try to cover few important points on this topic. Research says Women on an average put 168 + chemicals on their bodies every day , it’s through skin care products , hair care products , cosmetics , Perfumes , Mists etc . 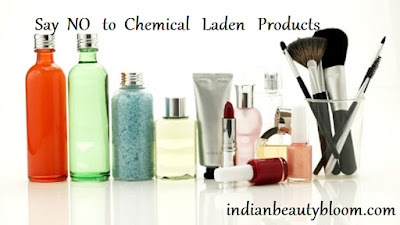 First we should know about the chemicals frequently found in beauty products . 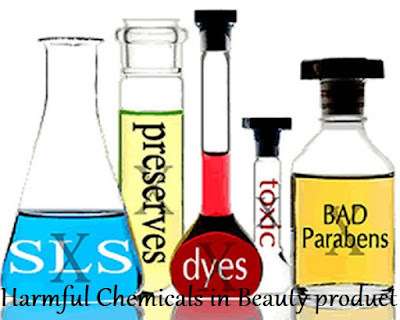 They are used as preservatives in most of the beauty products . Can cause hormonal imbalance , early puberty and other health problems . Mostly found in shampoos . Can cause problem in Kidney & Liver . These are found in Shampoos , Car wash etc . Can cause Skin allergy , depression . Can cause Skin irritation or Allergy . They are found in sunscreen creams & lotions . Common names of these chemicals are Avabenzone , Benzophenone , PABA etc . These chemicals are easily absorbed by the body and are endocrine disruptors . It is a Petrochemical derived from Petroleum or Coal Tar sources . They can affect respiratory system and cause skin allergy . So now one can understand what we have been using since childhood and how harmful it was to us and how harmful it is if we continue to use it . Now we have the option to switch over to better products which are chemical free and toxin free . Yes I am talking about Organic , Herbal & Natural Products . Past few years we have seen a boom in this industry , specially on online media as more & more people are becoming aware of the situation . Though bit expensive these natural brands are much better than the regular ones which are loaded with harmful chemicals and toxins . 1. They are better for your skin & health . Products from these herbal & organic brands have less or no chemicals in it . They use natural ingredients and many of them are fragrance free , color free , preservative free . So they are safer . Many of them have less shelf life like that of 6-8 months only and some of them are needed to be kept in refrigerator as they are preservative free . I have used many such products and found them too good & effective . As discussed above these products are free of harmful chemicals . These products are eco friendly as they have minimal or no chemicals . Since they contain natural ingredients , they are gentle on skin . Like moisturizers from these natural brands have Cocoa Butter , Shea Butter in it which are too good for skin . These organic skin care & beauty products have good amount of anti oxidants , Vitamins in it thus they help to protect the skin from premature ageing . Reasons : Poor eating habit , stress , pollution , hair styling devices , chemical laden products etc . When one is using herbal hair products like shampoo , conditioner or oils , one is actually doing good to themselves as these products prevents hair fall and other hair problems . As these natural products are rich in natural ingredients like some good oils , henna , some herbs etc . So better to switch over to these herbal & organic products for our own betterment . Do share your views on this topic in the comment section below . The Content herein is own by the blogger and SuperbloggerChallenge is not responsible for any kind of infringement caused .